These blossoming bowls unfurl from the inside, marrying versatility and beauty. These blossoming bowls unfurl from the inside, out with graduated pottery that marry versatility and beauty. Ideal as striking serveware, each set nests eight bowls useful for small and large gatherings alike. Designed with a delicate look but a sturdy frame, these bowls are ideal for everyday dining. 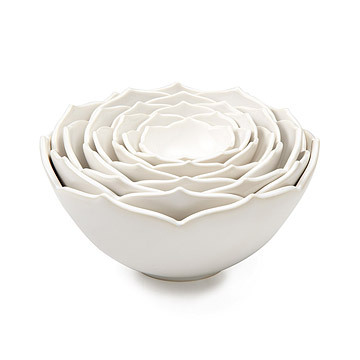 When not in use, nest pieces together for a sculptural, lotus flower display to enliven your table. Handmade by Whitney Smith in California. Ceramist Whitney Smith fell in love with throwing clay one prophetic afternoon in 1994 when undertaking her first basic pottery class in Santa Cruz, CA. As an undergraduate student studying anthropology at the University of California, she soon found herself pursuing independent pottery studies every chance she could. Smith carved a small studio in her garage and sought out an apprenticeship, assisting local potter Sandi Dihl. When it came to deciding between graduate studies in anthropology and taking her artistry further, she chose clay. Smith took her passion to San Francisco, where she developed her work, while continuing to apprentice, this time, under artist Bob Pool. As 2000 approached, Smith rallied support from friends, family and clients--and finally made the transition into a full time potter, launching her ceramics studio in early 2000. Inspired by painting and other two-dimensional work, Smith begins her work by throwing clay on a potter's wheel, then carves texture onto its finished shape. "My design sense is primarily informed by my obsession with flowers and other forms found in nature," says Smith. "I like the look and feel of old things and antiques, and my glaze choices have a certain look that reminds people of a different era. I try to emulate the craftsmanship of an earlier time." I haven't used these bowls yet, but I know they will be perfect for entertaining and for everyday use. You must be careful with handling though - very delicate! These bowls are just gorgeous and I get compliments all the time. I love them so much I looked up the potter and bought some additional items. They all currently sit on my kitchen island where they make me smile daily. This was a beautiful house warming gift. My friend loved it! Very different - could be used as a serving bowl or just admired! These bowls are pretty nesting on their own and I will use them floating gardenias or with nuts and candies on the table. When I unpacked them and nestled them they would "ping" every now and then. I would like to ask the artist about this. They were not cracked in any way.